noon Mountain Time on Tuesday, February 13: Registration Deadline: All presenters, performers, panelists, collaborative pianists, & composers whose works will be performed on the program must register to confirm their participation. Thursday, April 5: Mail-in Registrations must be postmarked by this date. noon Mountain Time on Thursday, April 5: Online registration closes. Participants must register on site after this date. The conference registration fee allows admission to all conference sessions. CMS members should log into the website prior to registering to obtain the member rate. noon Mountain Time on Thursday, April 5: Cancellations received before noon Mountain Time will be entitled to a full refund, less a $10 handling & processing charge. Registrations cancelled after 12:01 p.m. Mountain Time will not be entitled to a refund. Registrations are non-transferable. The Pacific Northwest Chapter of The College Music Society is pleased to announce its 31st Regional Conference on April 27–28, 2018, at Washington State University in Pullman, WA. The Program Committee welcomes proposals for demonstrations, lecture-recitals, panels, papers, performances, posters, and workshops from CMS student members that relate to all aspects of music creation, performance, scholarship, teaching, learning, career considerations, and other areas of interest to the music profession. The Program Committee solicits the broadest representation of topics within our profession, including global musics, new technologies, popular genres, innovative teaching models, multidisciplinary issues, cross-cultural perspectives, history, analysis, career issues, influences of race and gender, and pedagogy, especially the transmission and acquisition of music in formal and informal settings in different cultures. Proposals that tie into the national topic “Diversity and Inclusion” are particularly encouraged. The Committee welcomes proposals from undergraduate and graduate students from all educational institutions. Please note: As a student, you are not limited to submitting proposals via the Call for Student Participation. You may submit proposals for consideration via the Call for Program Participation, Call for Performances, and Call for Scores. The Call for Student Participation has a later due date and is designed to encourage more student involvement. Demonstrations are limited to 25 minutes. A demonstration enables conference attendees to learn about methods, resources, or products. These differ from workshops in that they are not interactive. Lecture-recitals are limited to 25 minutes. Lecture-recitals provide opportunities for a combination of speaking and performing. Panels are limited to 25 minutes. A panel provides the opportunity to examine a topic via multiple perspectives. A panel will have at least two panelists and may include a moderator. Papers are limited to 25 minutes. A paper is a presentation of research or a significant discovery. It is usually a spoken presentation but may include significant audio or visual documentation or support. Performances are intended to present live music, and speaking is generally limited to brief, introductory comments. Please note: this is not the appropriate venue for featuring the work of CMS composers; rather, composers interested in having their own work performed should respond to the Call for Scores for this conference. Posters present an idea or project via a compelling visual display. Time will be scheduled during the conference for poster presenters to interact with attendees regarding their research. Students are particularly encouraged to consider submitting posters for the conference and a special call for student posters is forthcoming. Workshops are limited to 25 minutes. A workshop is a hands-on, interactive session designed to enable conference attendees to learn about methods, resources, or products. Prior to submission, proposers must communicate with all co-presenters regarding their interest and availability. Proposals not listing all participants will be deemed incomplete and will not be considered. All persons whose work is selected for inclusion on the program are expected to register for and attend the full conference. Proposers agree to present on any day of the conference should their proposal be accepted. The College Music Society does not fund travel expenses of accepted presenters. Proposers must submit their own work and may not submit proposals on behalf of others. The Primary proposer must be a current member of The College Music Society. Persons interested in submitting a proposal should check their membership status well in advance of the submission deadline. Please note the processing time for membership applications and/or renewals is 1–2 business days. A maximum submission of TWO proposals per person is allowed. Electronic submissions are required. Proposals sent by mail will not be considered. Proposals that require an organ will not be accepted. The proposal’s title & format. An abstract of 250 words or less. Performances require program notes in lieu of an abstract, and are also limited to 250 words. Preparing an Abstract—The Program Committee chooses presentations based primarily on the abstract as submitted, so it is important to write an abstract that the Committee will understand and can evaluate fairly. The purpose of the abstract is to convey to the reader what will be said in the presentation. Do not merely describe the subject or list the topics to be covered. Rather, state the main point of the presentation, outline the subsidiary points, and summarize the evidence offered, so that someone who has not heard the presentation can know in brief what it will say and can evaluate its contribution to our knowledge and understanding of music. The abstract, like the presentation itself, should be clear to an audience of musicians and music educators of all kinds, not just to those with a narrow specialty. While it may be necessary to set the context or lay out the problem to be addressed, this should be kept to a minimum. A list of required equipment and Internet needs. Proposals for lecture-recitals and performances must also include a brief .mp3 recording of the presenter to demonstrate proficiency. Sound files may accompany other submissions but are not required. A biography of all involved persons (250-word maximum per person), if applicable. If your presentation includes 3 or more persons, download this spreadsheet, save the file using your name as the file name (e.g., smith-john.xlsx), and complete the requested information for each involved person. You will be required to upload this completed file with your proposal. The name(s) or affiliation(s) of anyone involved in the presentation should not appear in the title or abstract, as submissions are evaluated anonymously. Proposals identifying the proposer or co-presenters will be disqualified. Names and affiliations may, however, appear in submitted biographies and in the “Collaborators” section of the proposal, as the review committee will not have access to this part of the application. Submissions that do not conform to the above guidelines will not be considered. Proposals must be submitted by 11:59 p.m. MST on Tuesday, December 5, 2017. Proposers will be notified no later than Tuesday, January 23, 2018. Presenters must be registered by Tuesday, February 13, 2018 to confirm his/her participation in the conference. You must be a CMS member to submit a proposal. Please log in and the 'Submit' button will appear in this location. Or, click here to join CMS. Horace Alexander Young, is one of a select group of “triple threat” recording and touring artists who is equally gifted as a multi- instrumentalist (woodwinds, keyboards and percussion), vocal musician and as a highly skilled composer/arranger. 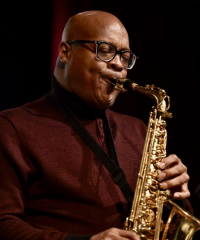 Although originally trained in college primarily as a classical flutist, his studies in saxophone were approached as a dual emphasis and his subsequent professional career has reflected this as well. His varied experiences have led to appearances on over eighty-seven (87) recordings and several international tours and performances with Sam “Lightnin” Hopkins, B.B. King, Bobby McFerrin, Bill Withers, Aretha Franklin, The Crusaders, The Manhattans, Joe Sample, Regina Belle, The McCoy Tyner Big Band, Johnny Kemp, Abdullah Ibrahim (Dollar Brand), The Temptations, Bubbha Thomas, Gerald Alston, Toots Thielemans, John Blake, Arnett Cobb, Jonathan Butler, Youssou N’ Dour, Onaje Allan Gumbs, Nancy Wilson, Kenny Barron, George Coleman, Dwight Sills, Milt Hinton, Dave Liebman, Norman Brown, Don Menza, Marvin Stamm, Betty Carter, Mark Ledford, The Four Tops and countless others. Having performed in eighteen (18) countries across five (5) continents his saxophone, flute and vocal skills have thrilled audiences at major Jazz Festivals in Montreaux, Hamburg, Leipzig, London, Paris, The Hague, British Columbia, Berlin, New York, New Orleans, Tokyo, Houston, Seattle, Gent, Laverkusen and Glasgow. Mr. Young previously served as Chair of the Contemporary Music Program at Santa Fe University of Art and Design (Santa Fe, NM) and Interim Director of Jazz Studies at Texas Southern University -where he conducted the Texas Southern Jazz Experience Big Band and The Joe Sample Jazz Orchestra (with Artist-In-Residence, Joe Sample). Prior to those appointments, he taught on the music faculty at Washington State University (1998-2008), Rutgers University and Sonoma State University. In addition to maintaining an active performing and recording schedule, Mr. Young is in constant demand as an adjudicator and as a guest performer for numerous festivals and schools throughout the USA, Canada and abroad. He also performs as a sideman with noted recording artists and as a leader of his own group. Mr. Young’s recent recordings are found on the Pacific Coast Jazz label. As a published author (Improvising Jazz Flute, Music Sales/G.Schirmer) and music journalist, he has contributed articles for SB&O (School Band and Orchestra) Magazine, GIG Magazine, Flute Talk, The Instrumentalist, Flute Focus, Canadian Musician and American Music Teacher. Horace Alexander Young uses Vandoren saxophone reeds, mouthpieces and ligatures exclusively, and uses SKB cases and AMT Microphones.